A pair of these stylish and functional tables will complete your bedroom décor. 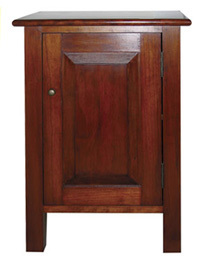 Behind the classic raised panel door you will find an adjustable shelf on which to store all your bedside needs. Mortise-and-tenon construction used throughout, with solid hardwood side panels and bottom for uncompromised strength and durability. Shown in cherry. 17" x 15" x 24.5"H.